SIZE: Approx. 3" x 3 H"
Measure to find center of fabric. Following arrows, draw intersecting lines across chart to locate center. Matching centers of chart and fabric, work stripes, heart shape, and large cross stitches in cross stitch over two threads using one strand black Impressions or one strand passion Impressions, and tapestry needle. 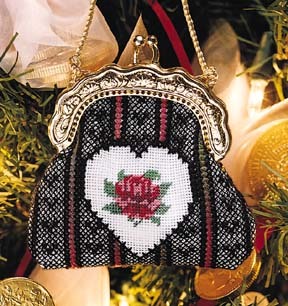 Work lace effect in cross stitch using one strand black Soie Cristale over two threads to fill unstitched areas with no symbols (outside heart motif). Work rose in half cross stitch using 2 strands Soie Cristale or 2 strands Waterlilies over one thread. Work 1997 in half cross stitch using one strand passion Impressions over one thread. Cut out stitched fabric and lining according to Christmas Keepsake Purse pattern. Sew side seams of fabric and lining using 1/4" seams; trim seams and clip curves. Turn purse right side out; turn lining wrongside out. Place lining inside purse, wrong sides together. Turn under raw edges of purse and lining; slip stitch together. Place purse inside metal clasp; sew purse to clasp through holes of clasp using one strand black Impressions and embroidery needle. Tie length of torsade to loops of clasp to form handle.